Sugar sugar in the mall, which is the healthiest of them all? If you are looking for a comparatively healthier substitute for your regular white sugar, then do consider bura sugar. But what is bura sugar? Why is it better than white sugar? Let’s find out. Bura sugar is the least refined or processed form of sugar or sugarcane juice. Comparatively, it’s the closest form of natural sugar. The sugarcane juice extracted from the pressed sugarcane, is left to boil. The heat allows the water or moisture to evaporate from the juice. What’s left is the thick sugar syrup which when cooled, hardens and crystallizes. The sugar obtained at this stage is known as bura sugar. Since it goes through the process of reduction and refinement only once, bura sugar still contains certain amount of nutrients. White sugar meanwhile, is the most refined or processed form of sugar. Such processing naturally nullifies or kills almost all the nutrients of the sugarcane juice and all you are left with is a nonnutritive sweetener. Bura sugar contains molasses (the brown portion of the sugarcane juice) which possesses certain minerals in very small amounts. These include calcium, vitamins B3, B5, B5 and iron. The darker the bura sugar, the higher the content of molasses. While, white sugar contains no molasses at all and hence lacks the brown colour as well. Organic bura sugar is safe as it does not contain sulphur – a chemical that can lead a number of health problems. 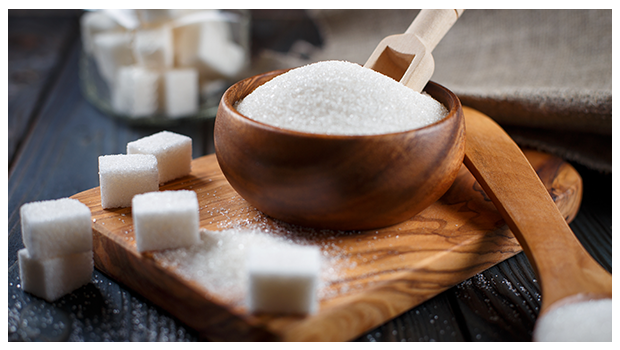 Both bura sugar and white sugar are said to have the same amount of calories. Author Manly P. Hal had once said, “Moderation is the secret of survival.” Therefore, although bura sugar might be a healthier option, but over indulgence can still lead to health issues like diabetes and obesity. The main advantage of consuming bura sugar is to stay away from the empty calories (non-nutritious) and chemicals induced white sugar. Choose 24 Mantra Organic’s Bura Sugar for healthy sweetness. It’s not only free from synthetic pesticides but also GMO-free.